Is there anyone out there who is adamantly anti-pasta? That is what I thought. Pasta is the big unifier, spanning cultures, inciting pasta making parties, and is infinitely adaptable and flexible. If you have a few more guests than you were expecting, you just cook a little more pasta. If you do not consume it all in one meal, you have the world’s most wonderful leftover for another one. Even were it not for my Italian background, I know that had I been born Kenyan, Inuit, or Samoan, I would still ardently adore pasta. 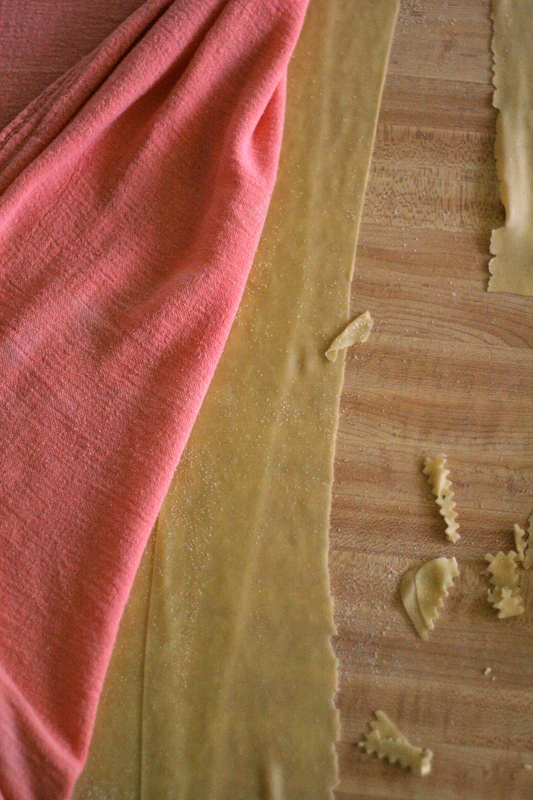 I have been making my own egg-noodle pastas, filled and plain, for many years. It started with my hand-crank machine from Italy with which I am still on amicable terms, but which requires a bit of help to quickly produce pasta. Then I experimented with rolling the dough by hand, stilo bolognese “Bologna style,” like the little old ladies making tagliatelli, tortellini, and tortelloni di zucca “pumpkin tortelli.” That one takes a ton of practice to achieve uniformly thin pasta sheets. Lately, I have settled on my Kitchen Aid attachment, which allows me to crank out sheet after sheet of pasta dough with minimal to no assistance. While I love a good pasta asciutto “dried pasta” like spaghetti or penne, almost nothing tops a bowl of homemade egg-based tagliatelli or tagliarin (almost identical to what we in the U.S. call fettuccine) with olive oil or melted butter, and grated cheese. Nothing that is, except my aunt Alida’s agnolotti Piemontesi. A couple of years ago, as I waxed loony about the first agnolotti al plin I had ever tasted (in the Canavese region of Piemonte), Alida mentioned that she had a wonderful recipe for just such agnolotti. I had every intention of learning with Alida, side by side, just how she did it, but I never had a chance. Why? These things take all. day. long. In fact, as a busy and zonked mother-of-two, I had to break it up into steps over several days. Sear the meat and cook on low with the vegetables. Mince and add the rest of the filling ingredients. Make the pasta dough. 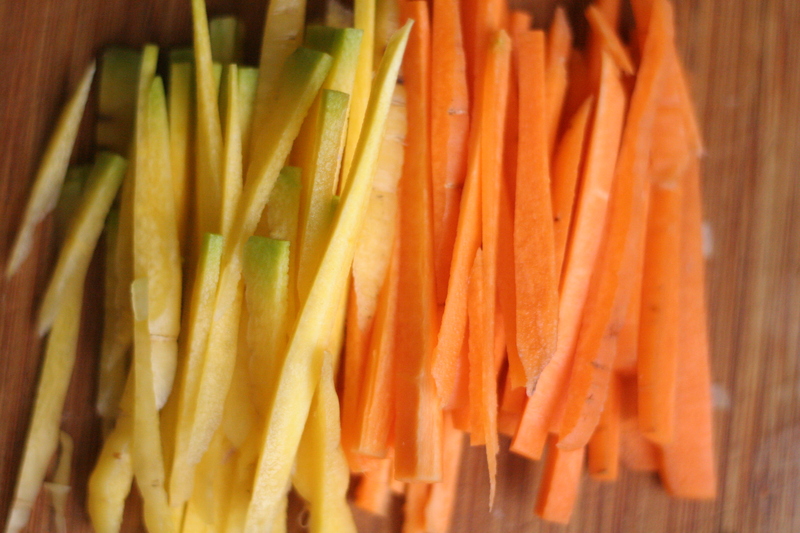 Fill and cut the pasta. Uh, make that four days in several hour segments. My reasoning behind bothering to give you a time-consuming recipe at all is that these agnolotti are possibly the most delicious filled pasta you will ever taste. I shuffle my feet and begrudgingly admit that….sometimes the best things in life take a good deal of time. 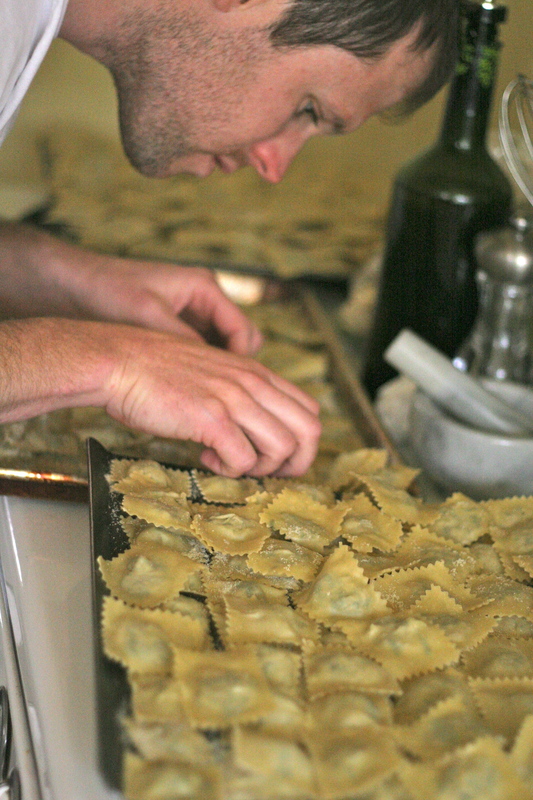 My advice to you is to plan ahead and have an agnolotti making party. Next time I make these, probably around the holidays, I aim to do the same. The incredible combination of flavors in this pasta is attained from a real balance of meats and vegetables. In addition to the pork and (free-range) veal meats, I cooked up well over a pound of spinach, four carrots, two onions, celery, and many fresh spices. The spinach ends up in the agnolotti filling, but the rest of the vegetables simmer slowly alongside the quickly seared meat for several hours, making a rich broth that will end up making the sugo d’arrosto or “roast’s juices” that act as condiment to at least some of the filled pasta. The other way to serve these delicious little packages of flavor is with a sauce of melted butter and fried sage. I tried both on different batches. 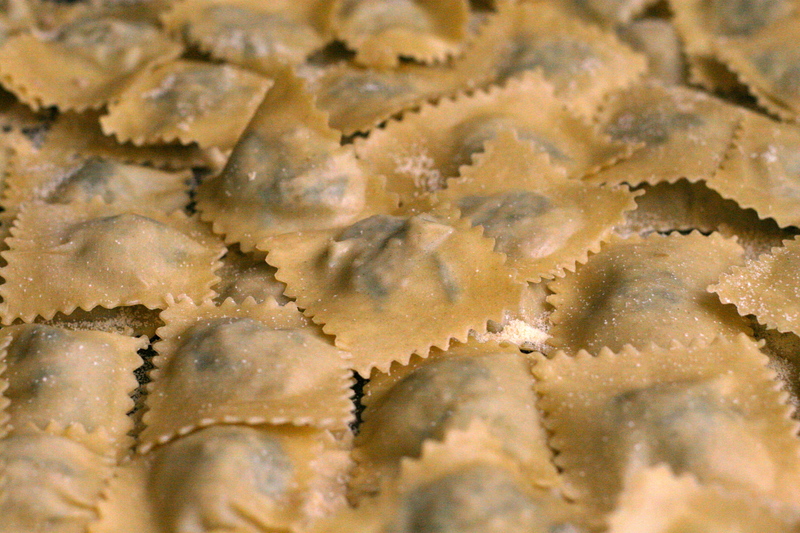 Before I offer the recipe, I have some tips for your agnolotti party. 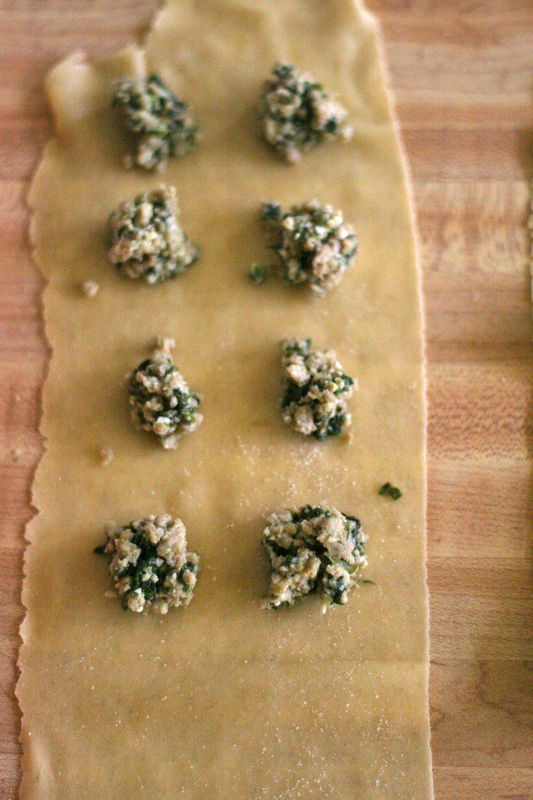 First, when making the dough, go for the thinnest setting you can without tearing the pasta. I cranked mine out at the second-to-thinnest setting. You want to see the filling through the pasta, luminous, but not breaking through it. The only way to know what is appropriate is to try it out. Second, use less filling than you think you should. I used a little espresso spoon to force me to keep the filling down, otherwise it explodes out of the seams as you attempt to close the pasta. Work in batches. I rolled out all my pasta to about the fourth to last setting and then covered it with old clean sheets so the would not dry out. Then, with the help of my dashing assistant, we would run the pasta through the final setting to its desired thinness, fill, cover it with another pasta layer, push down the seals, and then cut through with the fluted pasta roller. Repeat twenty or thirty times. No matter how tempted you are to stack the agnolotti on top of each other, no matter how much semolina you sprinkle between the layers, do not do it! I warn you that you will ruin a fourth or more of the agnolotti. As they rest some of them inevitably begin to fuse and when you attempt to separate them you will be cursing as the pasta tears away to expose your filling. Prepare yourself with lots of clean empty table space or many cookie sheets. 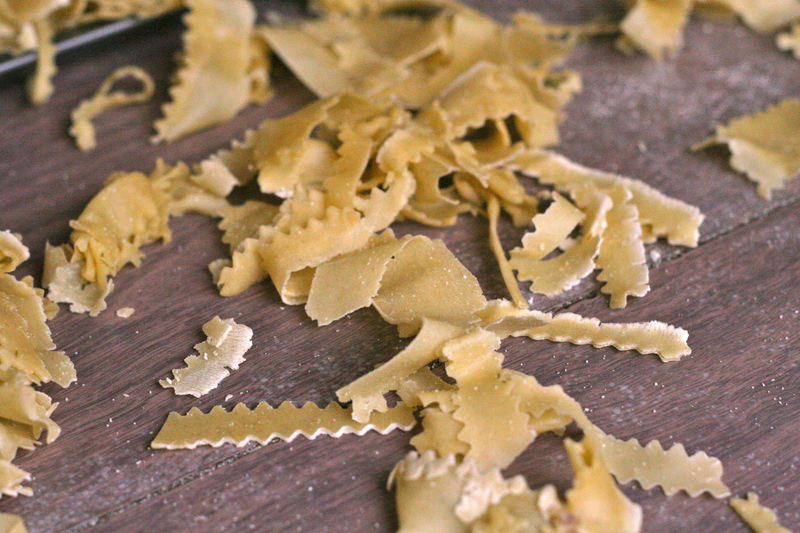 Finally, do not throw away the little scraps of pasta that you cut off of each agnolotti. Save them to dry out too and cook your malfatti (“badly-mades”) or maltagliati (“badly-cuts”) for some other night of pasta. Ours ended up as my son’s dinner creation where he chose rainbow swiss chard and baby broccoli out of the garden with a little sautéed garlic and pecorino romano. With very few adjustments, I give you Alida’s agnolotti. Mince 1 onion, the celery, carrots, and garlic. Heat several tablespoons of olive oil in a large frying pan with large sides and quickly sear the outsides of the meats, 1-2 minutes on each side. Remove the meat to a plate and saute the minced onion, celery, carrots, garlic, bay leaves, and rosemary in the same pan until the vegetables are translucent. 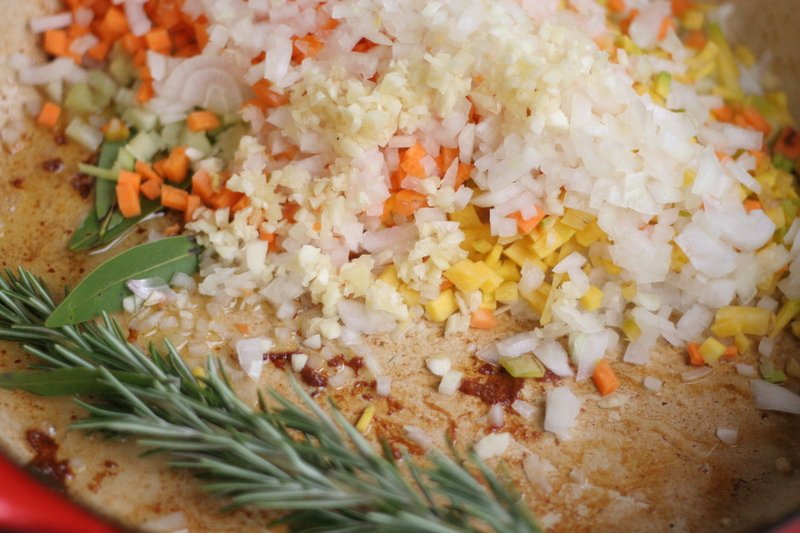 Return the meat to the same pan full of veggies and add water or broth until the meats are almost covered. 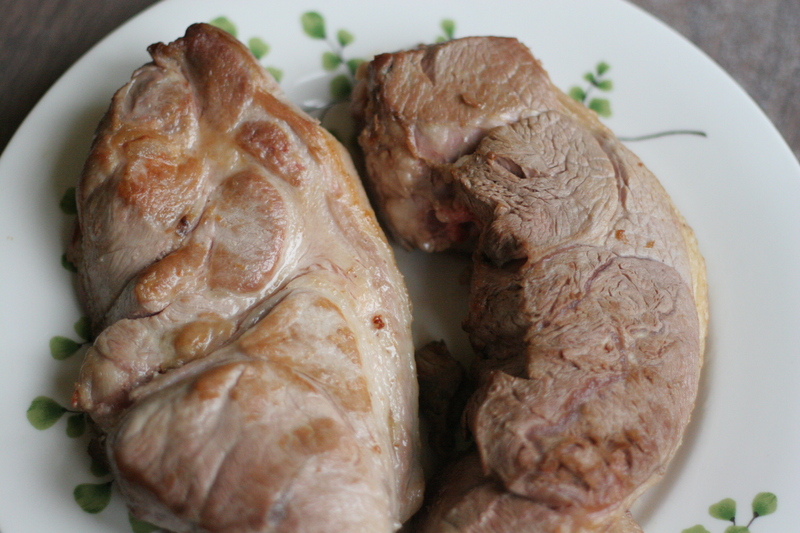 Once the liquid begins to simmer, turn the heat to its lowest setting and cook for 2-3 hours, turning the meats once or twice until they are tender and falling apart. Remove the meat to a plate and let it cool (or refrigerate if you are doing all of this in daily steps) and strain the remaining liquid. 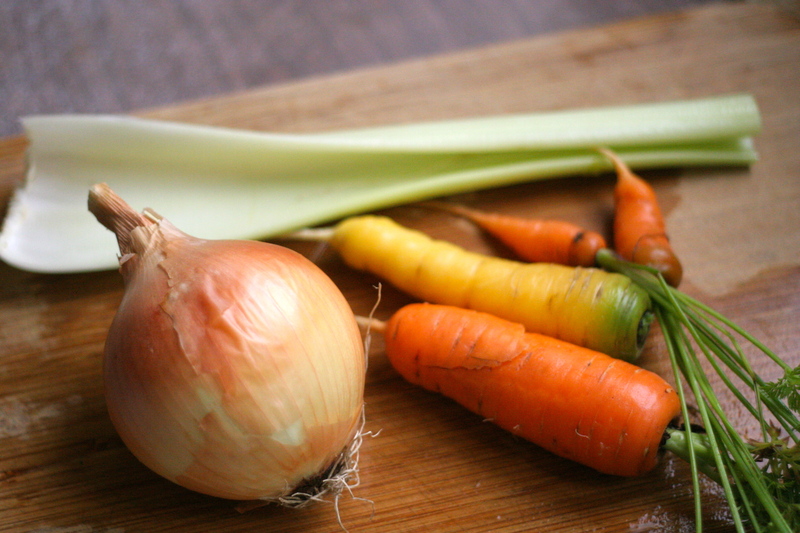 This will be your broth sauce. Return the strained liquid to a pan and cook on high heat until it is reduced to 1/4 of what it was and set aside to cool (or refrigerate). If you are continuing on, mince the meat either with a meat grinder or your knife. Mince the remaining onion and saute it in about 3-4 tablespoons olive oil until translucent and soft. 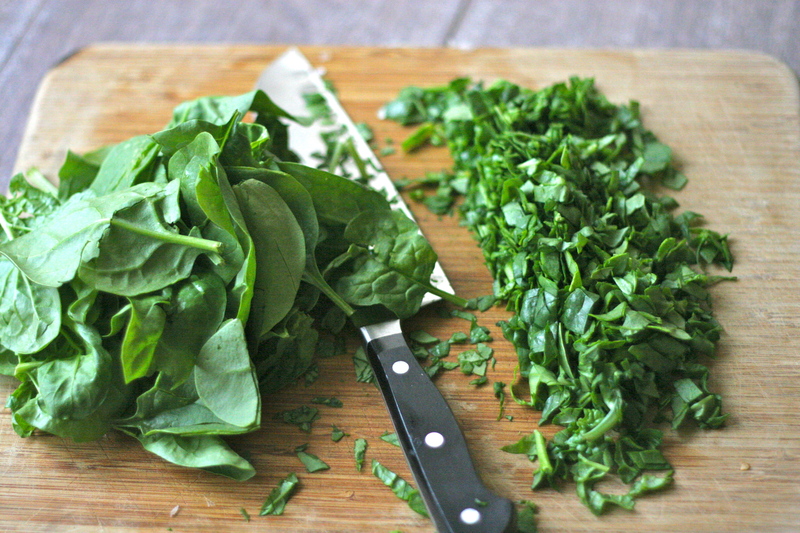 Chop the spinach into small bits and then add it to the onion to cook down. Add the minced meat and cook another 10-15 minutes. Let it cool down and then pour it into a large bowl. Add the Parmigiano, the three eggs, salt, and pepper and mix well. Set aside. To make the pasta, make a large mountain of the flour and push down a little hole in the mound. Add 3 eggs and 5 yolks, slowly incorporating the surrounding flour. There are a million tutorials on this part if you look on the internet. You could also take the lazy man’s approach and do it all in the Kitchen Aid with the dough hook. Knead it with care until the pasta is smooth and glossy. You may have to add another egg or two, but do not be hasty about it. You do not want a gooey, wet dough, but rather smooth and supple. Prepare some clean dry counter or table space for your pasta and sprinkle it lightly with semolina flour. On a separate clean flat surface, roll out the pasta dough with a rolling-pin or roll out on the largest setting of your machine, according to its instructions. If you are using the machine, fold the pasta over itself and then run it through again, repeating until you have a very smooth dough. Repeat until all the pasta has gone through and then cover with a clean sheet. Now begin running the pasta sheets through until they are about the fourth to thinnest level and cover well with the clean bed sheet. To fill your pasta have the filling ready and maybe even a clean glass of water, in case the pasta begins to dry out too quickly. Run two sheets of pasta through the second-to-thinnest pasta setting and then fill. You will put little pinches of filling (I used an espresso spoon to limit myself) spaced apart and then cover with another sheet of pasta. 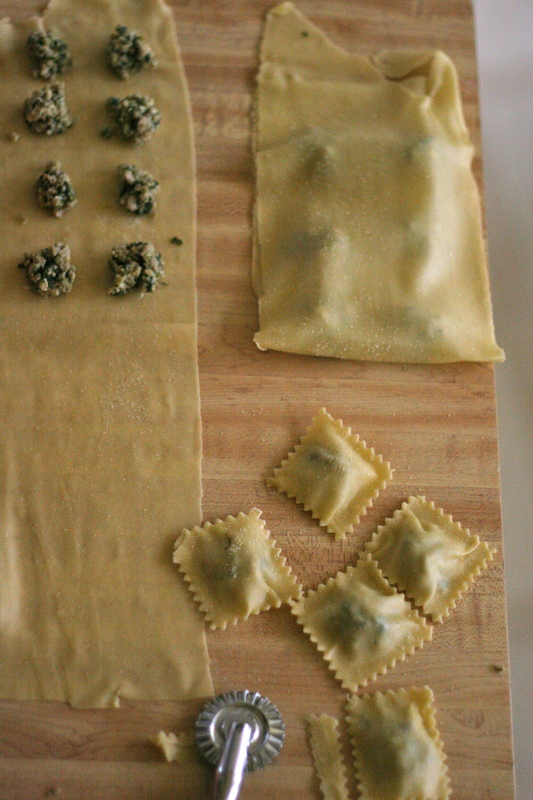 Press carefully, but firmly all around each filling lump and then with your fluted ravioli/pastry cutter cut a cross hatch pattern around the filling so that you have either squares or rectangles. 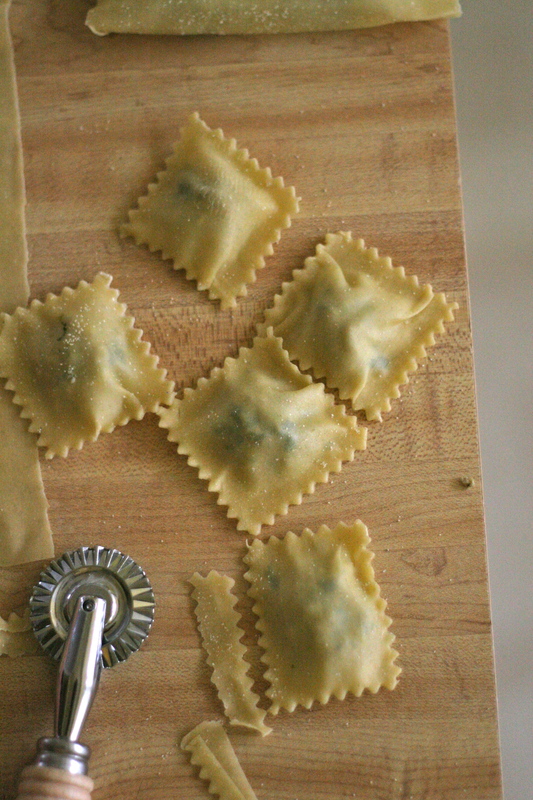 Carefully move your agnolotti to a prepared surface or cookie sheet with a sprinkling of semolina. Do not layer on top of each other or they will stick. Repeat ad infinitum. Let them rest uncovered for a couple of hours. I freeze several trays and then bag them for later and the rest I eat that night. To cook your agnolotti, heat a huge pot of boiling salted water and then add your agnolotti, gently stirring once or twice to separate them. Cook 2-3 minutes or until the pasta tastes done. 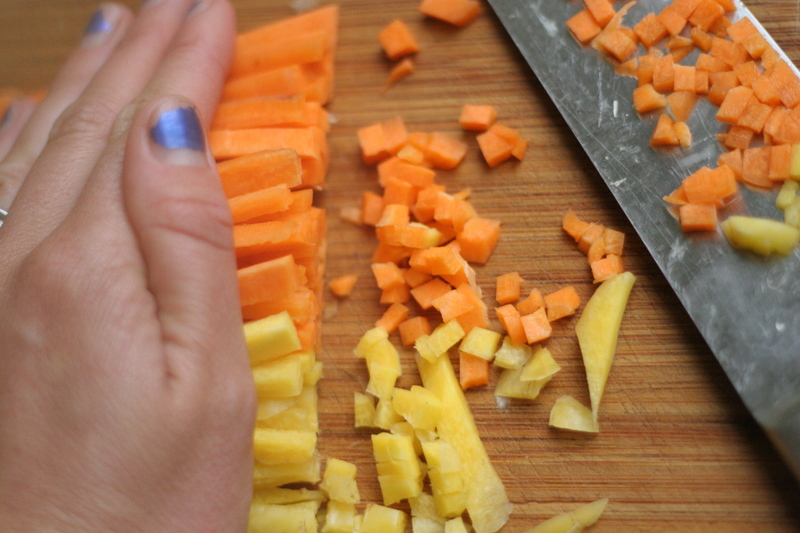 With a slotted spoon remove them carefully and place in the large pot of heated, reduced broth while you do the rest. 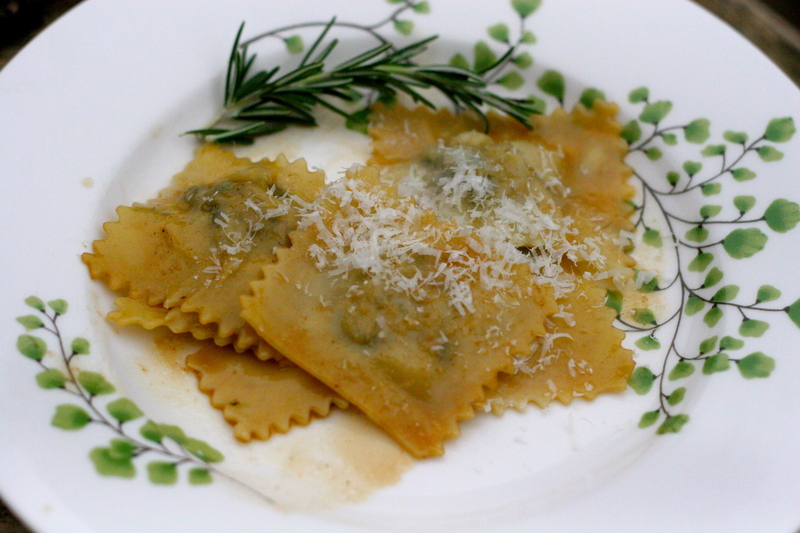 If you prefer, you can also dress the agnolotti with a sage butter. Finish with a healthy grating of Parmigiano cheese. This entry was posted in Dinner, Lunch, Pasta, Recipes for Egg Yolks and tagged agnolotti al plin, how to make homemade pasta, piemontese agnolotti recipe, recipe for filled pasta dough, ricetta agnolotti piemontesi. Bookmark the permalink. I think I want to join you for the pasta making party rather than attempting this by myself. It looks fabulous and I hear it is the best Agnolotti that the ‘gourmet chef’ ever tasted. My mouth is watering just thinking about it.